Photo: Juan Ocampo for Metro. I know there’s a lot of interest in Metro’s efforts to electrify its bus service — with the Metro Board of Directors earlier this year embracing a goal of a fully electric fleet by 2030 with plans to electrify the Orange Line and Silver Line by 2020. 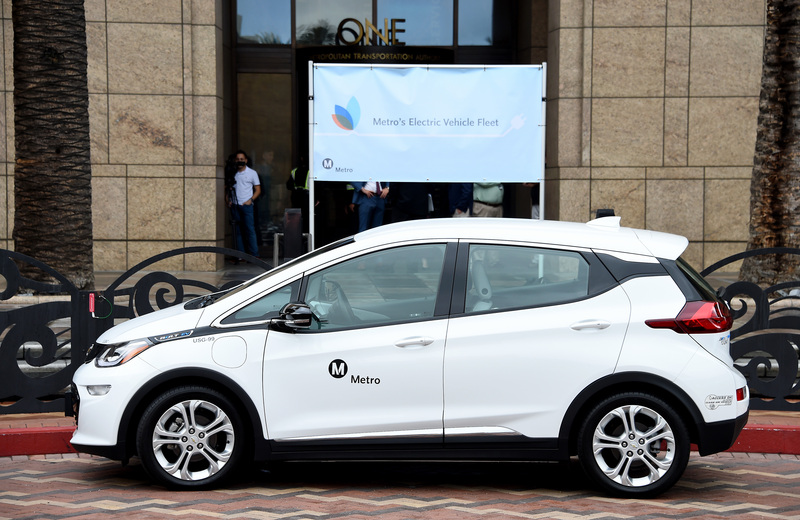 On another front, Metro recently purchased 10 Chevy Bolt electric cars to use as part of its non-revenue fleet used for field operations. The Bolt is a zero emissions vehicle with an estimated range of 238 miles per charge and helps fulfill Metro’s goal of lowering the agency’s overall greenhouse gas emissions (greenhouse gases are the cause of climate change). The agency will test of the vehicles over the next year to see if they’re a good fit for the agency. Most of the vehicles in Metro’s non-revenue fleet are already hybrids, so this takes things a step further. As part of the pilot program, Metro staff will try to determine the expense of operating electric vehicles versus hybrids. The upfront costs of EVs are usually higher but operating costs and maintenance for EVs may be lower over the long haul. More pics of the new Chevy Bolts are in this Flickr album. My experience with the Toyota Prius was they were pieces of junk that had slow acceleration and felt to be very cheaply made. In addition it seemed they were always in the non revenue shop which made it difficult to even have regular maintenance on the Road Supervisors units. At about the same time the MTA purchased some small Pontiac economy cars that were used as CEA units in the Divisions. I rarely saw them in the shop although in my estimation they were operated under much harsher conditions. Hopefully these Chevy’s will perform much better than the Toyota’s. I drive a 2005 Prius with 225.000 miles on it (although I now mostly use the Expo line and my bike) and never had any problems. It still has the original brakes (!) and I consider it the best car I’ve owned. I had Chevy’s, Fords and Chrysler cars and they were all pieces of crap. Although now I’m seriously considering a Bolt or Volt since a Tesla 3 will have too long a wait time. Why are they not looking at smaller 2 seater cars? How often during normal use are these cars (or those for driver relief) driven with 2 total persons in the vehicle? How often with 3 or more? How often would a vehicle with a range of 130 miles (needing 4 or more hours to recharge) suffice? I suspect that there are several less expensive (to acquire and/or operate) options available.